If you’re looking to spruce up your existing landscape with updates for spring, now is an excellent time to plan. Although we are still in the height of winter, your beautiful landscaping needs your attention throughout the year. 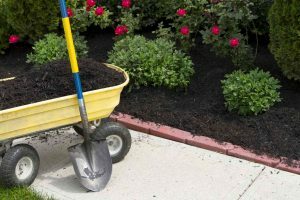 Many trees, bushes, and mulch beds require maintenance in colder months in order to bloom and flourish when the weather breaks in the spring. Don’t fall behind for spring from a lack of preparation. Instead, follow these five easy tips for steps towards warmer weather. Winter weather can take a harsh toll on your landscaping. Even plants and trees that are tucked away in mulch beds are not always safe from the elements. If you notice that the mulch in these areas are getting low, replenish them with added mulch to keep them safe for the rest of the season. A little goes a long way, as they will only need enough to cover their roots until the spring. Your fruit trees and berry bushes may need a little more TLC than the rest of your landscape this winter, but your hard work is sure to pay off at the sight of your healthy trees and colorful bushes in the spring. On a warmer winter day, consider pruning these woody trees and bushes back to their healthy shape, and watch your efforts bloom this spring. If you notice snow piling up on your evergreens following a winter storm, gently shake remaining snow from branches to prevent straining and breakage. Any ice that may be covering the branches is safe to melt naturally, as attempting to break off this ice manually may cause severe damage to your beautiful trees. Warmer days of winter are a perfect opportunity to turn your soil as it thaws and expose unwanted insect eggs before they set in your garden. The in-between of thawing temperatures is a perfect climate for this activity to prep and improve your soil for a warmer spring. Tending to your winter landscaping may jog your memory for ideas that you have for your spring landscape design. If you’re looking to spruce up your existing landscape with updates for spring, now is an excellent time to plan. Write down any ideas that you may have while planning this winter, and present these ideas to a professional to bring them to life this spring. Rhine Landscaping has the tools to make your yard beautiful throughout the year, so trust us with all of your landscaping and poolscaping needs. We have the expertise and knowledge to complete any and all of the landscaping projects on your list. For more information about our services, visit us online or give us a call at (410) 442-2445. For more tips on how to keep your yard and pool looking great year round, follow us on Facebook, Twitter, Google+, LinkedIn, YouTube, and Houzz. This entry was posted on Friday, January 26th, 2018	at 1:12 pm	and is filed under Landscape Maintenance	. You can follow any responses to this entry through the RSS 2.0	feed. Both comments and pings are currently closed.